A history professor known for her belief that the 9/11 attacks were a result of “U.S. 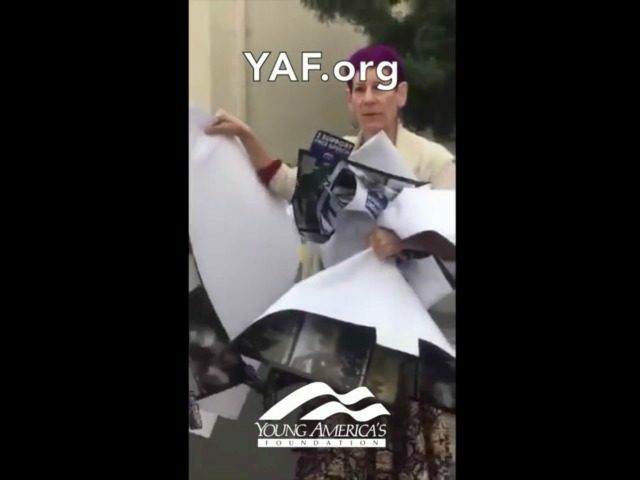 imperialism” at a Californian community college was caught on video ripping down “Never Forget” memorial posters. Lovett is known for her views that U.S. imperialism is to blame for the 9/11 attacks, after she promoted a press release from the Black Radical Congress blaming America for the attacks as a result of their “genocidal levels of death and destruction” to other professors in the wake of the tragedy. Campus leaders had already tried to thwart attempts from the Young Americans for Freedom chapter to commemorate the event after they refused the group active status, meaning they were unable to hold a previously approved memorial service. Kyle Chiu, the YAF’s vice chair, told The College Fix that they had submitted the “exact same documents we submitted last year with no problem at all,” but that this year were rejected with no clear justification, so the event had to be cancelled. Students consequently put the posters up around the campus instead, before Lovett decided to pull them down. “I honestly felt like Saddleback was better than this. I am very disappointed that we cannot come together as a higher learning establishment to remember the lives that were lost on 9/11,” Chiu said. “It breaks my heart to see such petty reasoning as to why we can’t honor fallen Americans,” he added.